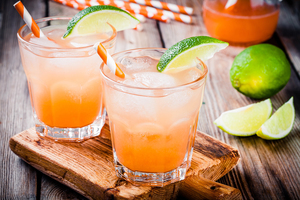 Cinco de Mayo wouldn’t be complete without tequila cocktail recipes, and Pennsylvanians are doing their part to celebrate this popular spirit. Did you know that alongside vodka and bourbon, tequila is the fastest growing spirit in popularity in the United States? Jose Cuervo was the number one selling tequila brand this past year in Pennsylvania with Jose Cuervo Gold coming in with the most bottles sold, and the brand ranked 22nd in the top 100 spirit brands sold in the state this past year. Want to sound like an expert at your Cinco de Mayo party? Let us help. Tequila is a distilled spirit made from the fermented juice of the agave, a spiky Mexican plant which resembles a cactus. There are two types of tequila: 100 percent agave tequila and mixto tequila (often called gold). One hundred percent agave tequila uses only Blue Weber agave sugars in production, and Mixto tequila mixes at least 51 percent agave sugars with other, cheaper-to-produce sugars. Typically, 100 percent agave tequila brands will produce three expressions. Each of the three categories has a different flavor profile due to the different aging processes. • Blanco (or silver) tequila is aged for less than two months and is a clear liquid. • Reposado is aged between two and 12 months and is more golden colored. • Añejo is aged between one and three years and is more amber colored. Extra Añejo is the newest category of tequila and is aged more than three years and blended with distilled water for an even smoother, richer taste. In the past year, Mezcal tequila has become a popular tequila go-to and is often used in craft cocktails. Makers of Mezcal are not limited to Blue Weber agave and can use upwards of 30 different types if agave when creating this tequila. No matter what brand or category of tequila you choose, we wish you a safe and happy Cinco de Mayo! Cinco de Mayo wouldn’t be complete without tequila cocktail recipes! Enjoy cocktails like the Primero Martini and the Fine Wine & Good Spirits Cocktail of the Month, Champagne Rita. Recipes and images are available for download here. Special thanks to www.finewineandgoodspirits.com for providing this information.